1. Superintendent of Prisons (SP) Medical, CONMESS 02. 2. Superintendent of Prisons (SP) Vetinary CONMESS 02. 3. Deputy Superintendent of Prisons (DSP) Pharmacy, CONHESS 09. 5. Assistant Superintendent of Prisons II (ASP.II), CONPASS 08. 1. Senior Inspector of Prisons (SIP), CONPASS 08. 2. 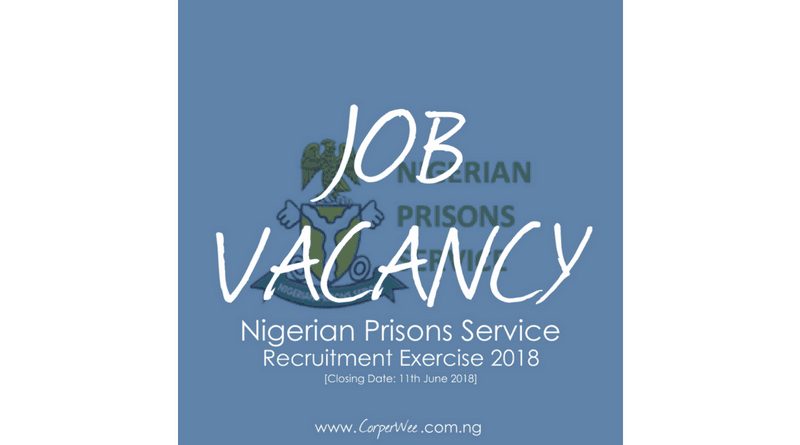 Inspector of Prisons (IP) Nursing, CONHESS 06. 3. Assistant Inspector of Prisons (AIP), General Duty, CONPASS 06. 3. Prison Assistant III (PA.III) CONPASS 03. 1. Applicants must be Nigerians by birth. 2. Applicants must possess the requisite qualification and certificates. Any certificate or qualification not presented and accepted at the recruitment centre shall not be accepted after the recruitment. 3. Applicants must be medically fit and present certificates of medical fitness from Government recognized Hospitals. 4. Applicants must be of good characters, and must not have been convicted of any criminal offences. 5. Applicants must not be members of any Secret Society, Cults or Drug Addicts etc. 6. Applicants must not be financially embarrassed. 7. Applicants must be between ages of 18 and 30 years. 8. Applicants heights must not be less than 1.65m for males and 1.60 for females. 9. Applicants chest measurement must not be less than 0.87 for men. 10. Computer literacy will be of added advantage.